It’s Spring Break, and one thing I don’t model well for my kids is a good work/life balance. I’m passionate about what I do, and I hope that translates for them so they understand why I do what I do, not that I’m just working myself to death for whatever reasons people do that. I was supposed to take my daughter out to do something fun today, but I forgot about a work committment, so we did what we normally end up doing, we compromised and tried to squeeze a little fun in between my mistakes. I often give her a hard time about her choice in television, (yes, she watches too much) but she’s very analytical about it, critiquing things like bad writing, bad acting and the basic economics of Hollywood. How can I fault her for that? In the course of her childhood, we have discussed many career possibilities. Fashion designer, dolphin trainer, marine biologist, psychiatrist and screenplay writer being just a handful of her interests going back to the age of three or four. At thirteen now, I know that these are formative years. They all are, really, but I like to think we’re (parents) given some lead time, before everything sticks, until it leaves a permanent mark. We spent today talking about screenplays. What they are, who writes them, good ones, bad ones and how to become a screenwriter. None of which I’m qualified to talk about. When I was a young man, I went through a two or three year phase where I wanted to be a director. What I really wanted to be was a screenwriter, but I didn’t know enough to know that then. I read books about filmschool, I obsessed over filmmakers and old 1960s avant garde movies. 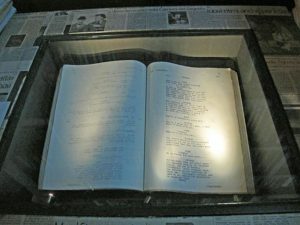 I copied screenplays to get a sense for how to create dialogue. I went to screenwriting conferences. And I used two old VCRs to build small movie clips to Megadeath soundtracks. I didn’t tell her all that. But I gave her glimpses of my own dreams to see if her current interests spark something that might turn into a lifelong passion or a job, hopefully both. 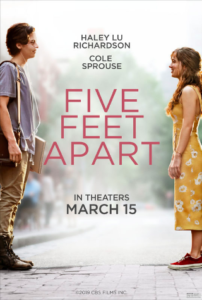 Then we went to see “Five Feet Apart,” a movie about two cystic fibrosis patients who fall in love in spite of the fact that they can’t ever be closer than (technically six) five feet apart. We laughed, we cried, and we talked about the power of words to create these stories that cause emotions to well up within us. This is not something I have to teach her, it’s just something I can experience with her. And that is really all I can do with her. We can explore these ideas one at a time. I can’t get attached to them, I have to live them with her without expectations. Whatever she chooses to do, I know that it will have been decided at the end of a long process of trying things on for fit. My boys are another story for another time.